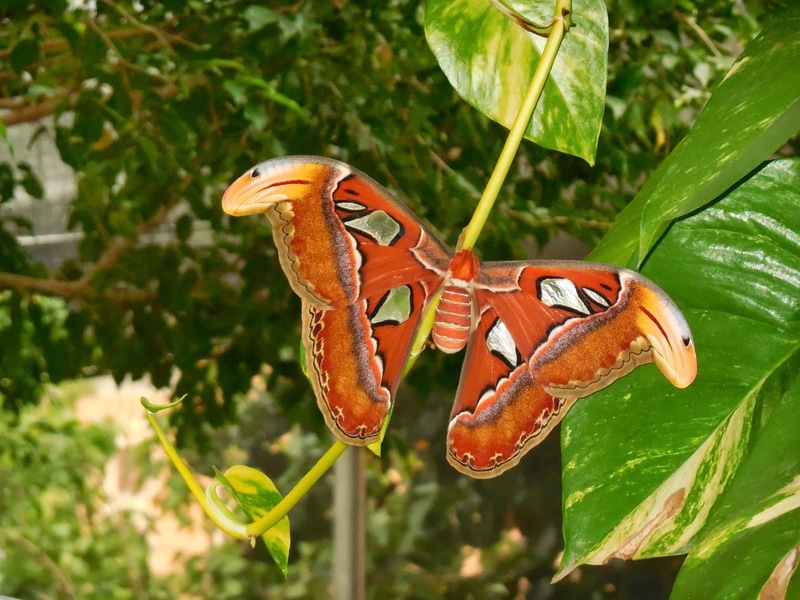 While the eggs were imported many years ago, The Butterfly Farm now maintains the Atlas Moth, monitoring the breeding carefully. Since one of theses magnificent specimens only lives about ten days, peak is anywhere from five to seven. Inactive during the day, the moth flies at night...very slowly. 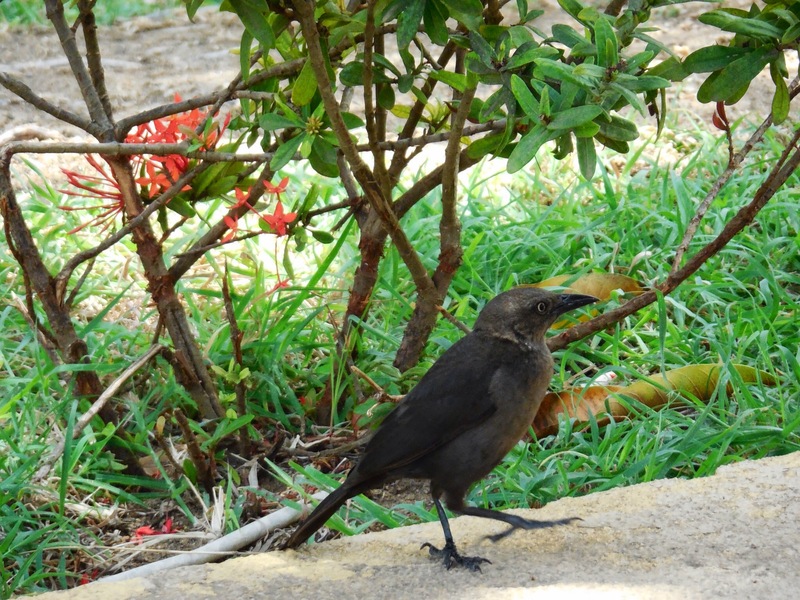 The Carib Grackle, has been around our resort daily. A shiny, thin blackbird with an unmistakable yellowish iris, is very chatty. When we sat outside to enjoy lunch, they come over, announcing their presence, waiting for a handout! The female, shown below, is more of a brownish than the distinct shiny black mate. Like that yellowish iris of the bird. What a magnificent moth and it always seems a shame their lives are so short. Love the birds as well. 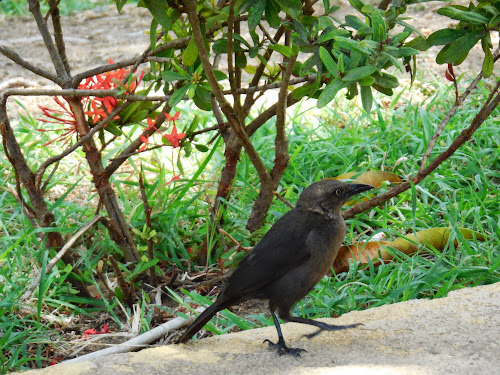 We don't have blackbirds in Western Australia. I am so enjoying sharing your holiday with you. Thank you. Wow, the Atlas Moth is gorgeous. I love the pretty colors, it looks huge.. 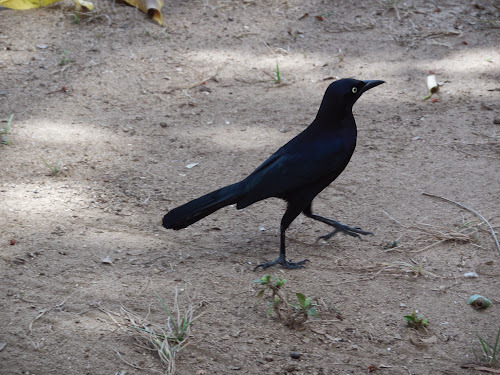 The Grackles are cool birds! Great post and thanks for sharing..Have a happy weekend! What a beautiful moth! Ours are not near as pretty. Oh my gosh, the moth is amazing!!! I have never seen anything like it!!! Each part of it...absolutely stunning. Very colorful. Oth, JP, unlike those we usually find in our flowers. What a beautiful and unusual looking moth. Soak up some sun for me JP. Love the grackles - the blue in the male is splendid. Birds are quite amazing when you think about them--cohabiting with us so well. The butterfly is just gorgeous.